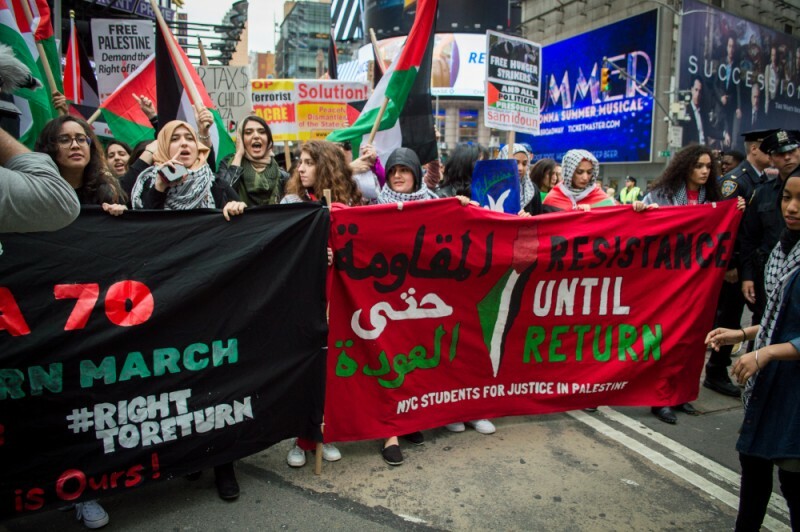 New Yorkers rally for Al Nakba Day | Fight Back! New York, NY – At least 900 people gathered in Times Square, May 19, to commemorate the 70th anniversary of the Nakba. The rally was called for by NY4Palestine, a coalition of organizations that stand for the liberation of historic Palestine. 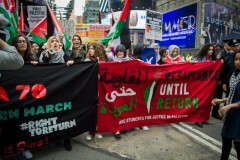 This was the second rally held in New York by NY4Palestine members. The first was held earlier this week on the 14th in Bay Ridge, Brooklyn. The rally continued with several speeches, including one by Jake Holtzman, from the Committee to Stop FBI Repression NY. Holtzman spoke on the connection of political repression and those organizing for liberation of Palestine. The rally ended with a march to the Israeli Consulate, where Kiswani gave a rousing cry to action to all to continue organizing.